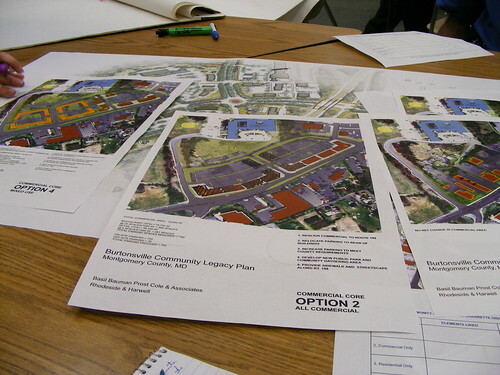 Part ONE on a series about the Burtonsville Community Legacy Plan charrette. Check out part TWO, in which we discuss the proposed "Village Green" and so-called "undesirables" in East County. East County residents tackled the future of Burtonsville's village center last night for the Community Legacy Plan charrette, initiated by the county to create recommendations for how to redevelop the Route 198 corridor. A discussion of how to improve Burtonsville's village center grew into a debate over demographics and crime in East County at last night's Community Legacy Plan charrette, held at Burtonsville Elementary School on Route 198. As Burtonsville has evolved from a rural crossroads to a growing suburb, the community has grappled with the accompanying economic and social changes. Local businesses have been suffering since the completion of the Burtonsville Bypass in 2006; today, the small village center faces threats from new developments under construction in Howard and Prince George's counties. In response, Montgomery County has hired two consulting firms to draft a list of recommendations for how the community should grow. Annapolis-based Basile Baumann Prost Cole and Associates will determine the redevelopment's economic feasibility, whileRhodeside and Harwell of Alexandria, is charged with urban design. Route 198 as it exists now. The consultants talked about the challenges faced by a community whose own residents had described it as "country but convenient." While it stands to benefit from nearby development, the village center struggles to remain relevant - regionally or locally. The streets are congested and disconnected; a slew of different owners with different agendas make the area look messy and disorganized; and the recent loss of the Dutch Country Farmers Market to a shopping center in Laurel destroys Burtonsville's one main draw. Residents look at different proposals for the Burtonsville village center before the charrette. 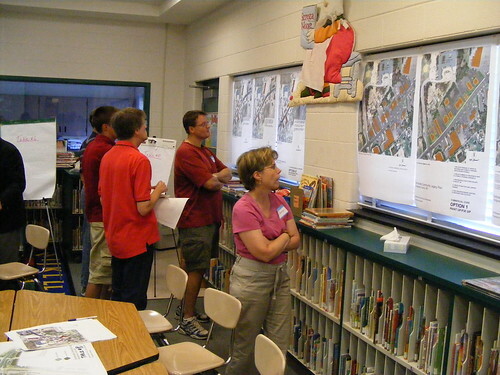 Charrettes are design workshops in which public officials and the general public get together to tackle a proposed development or community plan. 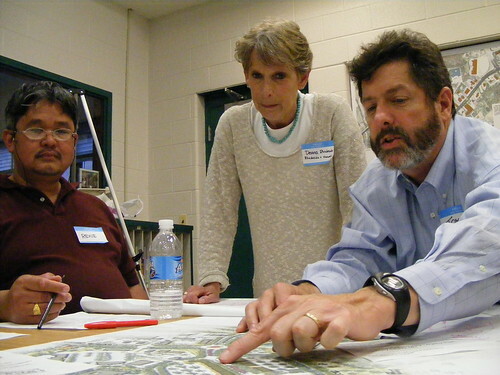 The iconic New Urban development Kentlands, in Gaithersburg, was first planned by charrette twenty years ago; in 2003, many of the original participants got together again to plot the community's future. Closer to home, the Planning Department held a multi-day charrette for its SilverPlace headquarters development in Downtown Silver Spring earlier this month. Last night's charrette is part of a three-month-long process to determine how to encourage economic development in the the Community Legacy Plan area, centered on the Route 198 corridor between Old Columbia Pike and Route 29. In August, the consultants will review the results from the charrette and return with more specific proposals. The audience was broken up into six groups, each of which coming to its own conclusions about how a portion of the village center should be redeveloped. I was seated at Table 4, with a pretty eclectic group - Dr. Robert Lennon, a pastor representing the Wyndham Woods Homeowners' Association; Mara Parker, aide to Councilmember Marc Elrich; programmer Thomas Meylan, who lives in Greencastle Woods; Roni Polisar, who lives near the Patuxent, and her husband Barry, a folk singer who recently appeared on the Juno soundtrack. Scribbled-over maps and drawings at Table 4. As my table pored over proposal maps and photographs of example projects, the challenge seemed to be how to maintain the "small-town" feel so many people associate with Burtonsville within the need to grow. 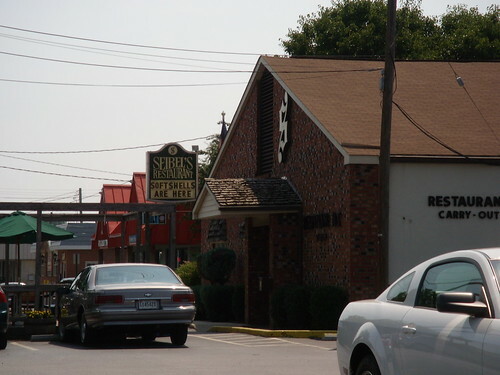 "What I like about Burtonsville is the remnants of its rural past," says Roni. "Burtonsville is the last rural outpost of Eastern Montgomery County." We all seemed to agree that the answer lay in a lot between the school and Route 198 proposed to become a "village green" in the Fairland Master Plan, drafted in 1997. As Parker tried to figure out ways to draw visitors to the space from buildings pushed up against the road, Barry joked about adding an elaborate fountain, a rickshaw and even a mini-Roman Colosseum to spice up the area - a response, he said, to some of the more unrealistic suggestions we heard from the neighboring tables. Roni, meanwhile, mused about what made the village center so unpleasant to begin with. 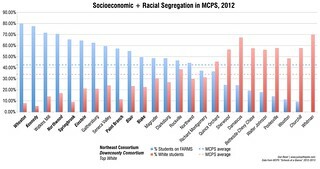 "I was thinking what was so unfortunate about the suburban experience," she says. "It's the parking lots." Each of the four options offered by the consultants took parking off of Route 198 and moved it in back as a way of making the road more pedestrian-friendly. Option 1, which proposed only minor cosmetic changes to the existing buildings, was largely rejected at our table, as was as Option 3, which proposed replacing everything with apartment buildings. Without any businesses, there was no reason for anyone outside of the apartments to visit, laments Meylan, who was concerned about losing the existing businesses he frequents in the area. "Anything that reduces retail reduces my reason to be there," he says. Many people liked Option 2, which nearly tripled the amount of commercial uses along Route 198. Barry was concerned that new buildings demanding higher rents would replace local businesses with "Starbucks, Starbucks and Starbucks," he says. Our table's mediator, consultant Kate Shiflet, suggested that an all-commercial development may not be feasible. "Without a residential component, redevelopment isn't going to happen," says Shiflet, who works for Basile Baumann Prost Cole and Associates. 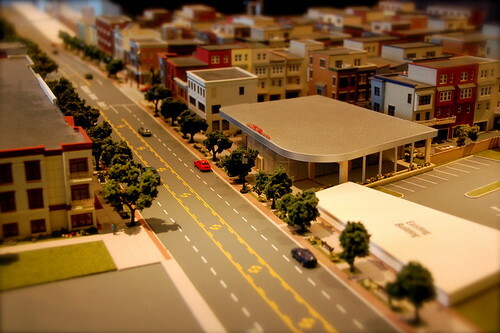 A model of the Arts District Hyattsville development, one of many precedents for Burtonsville's revitalization. Photo courtesy of Chip Py. That brought us to Option 4, which offered a mix of retail space, apartments, and live-work units. Roni was concerned about the density, but I suggested that live-work buildings - rowhouses with retail or studio space on the bottom floor and living space above - might be an affordable way for local merchants to remain in Burtonsville. She liked pictures the consultants gave us of the live-work units in Arts District Hyattsville (a development Just Up The Pike wrote about last fall), calling it "historic, but still with a small-town feel." While all of us at Table 4 came from different backgrounds and had different ideas of how Burtonsville should look, we'd come to a pretty solid understanding of what we liked and didn't like about the four proposals. One thing was clear: we weren't opposed to change. 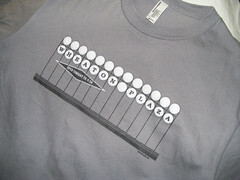 If anything, we wanted to talk about improving the rest of the village center. The study area didn't include the shopping centers north of Route 198, including the Burtonsville Shopping Center - home to the Dutch Country Farmers Market - which will be redeveloped later this year. "One thing that surprised me was the truncated scale," says Meylan. "I was expecting a little bit more of a comprehensive approach . . . a piecemeal approach gets piecemeal results." Hey, great pictures and good synopsis!